Christmas is fast approaching and while it brings with it the opportunity to spend precious time with loved ones, it can also bring an anxiety about what gifts are best to buy for them. Relax, ani M INTERIORS has the season covered. Here are eight gifts they are sure to love. If the Conran family isn’t designing beautiful pieces for the home then it’s sourcing them. 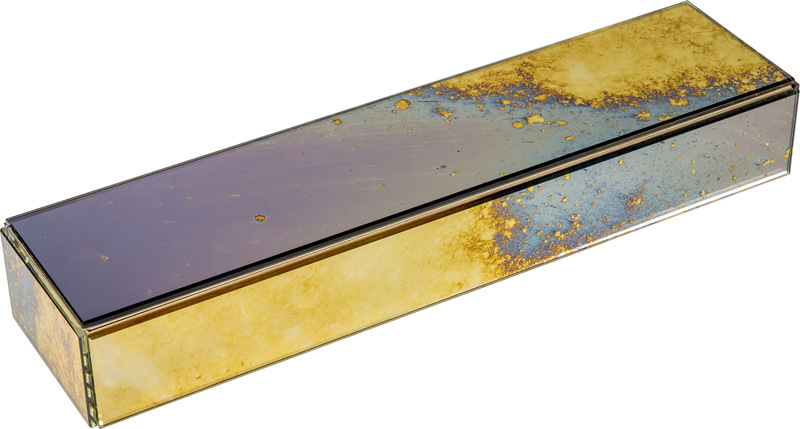 This handmade Italian jewellery box is designed by Garth Roberts for Antique Mirror. The oxidisation process on the mirror creates beautiful shimmering patterns and colours that evoke images of the rising sun. Do you have a coffee lover in your life? 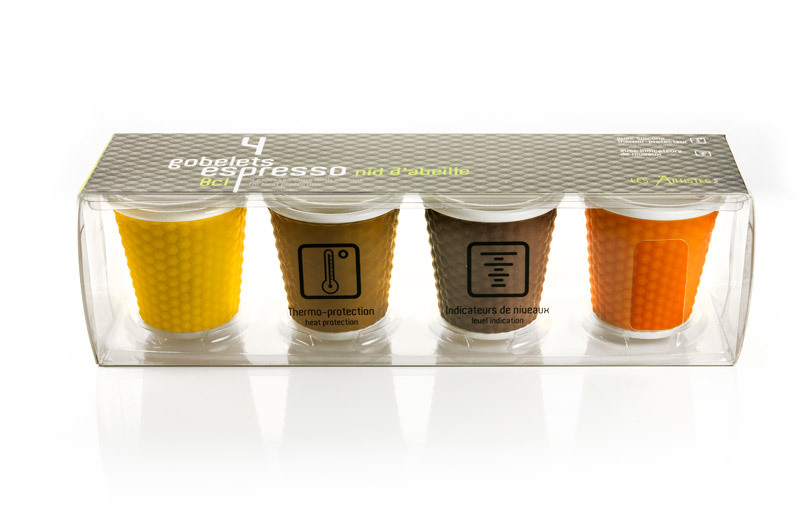 Not only are these nifty 3oz porcelain espresso cups adorable but they also helpfully have the measurement indicators inside. So there’s no excuse for getting the proportions wrong on your favourite morning ‘ristretto’. The hardest part of shopping at Molton Brown is choosing just one fragrance. Follow the spice trail with orange and bergamot, breathe in the orange blossom at the foot of Mount Fuji or explore oriental temples with scents of samphire, sandalwood and ylang-ylang. This 12-piece gift set means you don’t have to choose and, as they are travel sized, you can take them with you on your adventures. 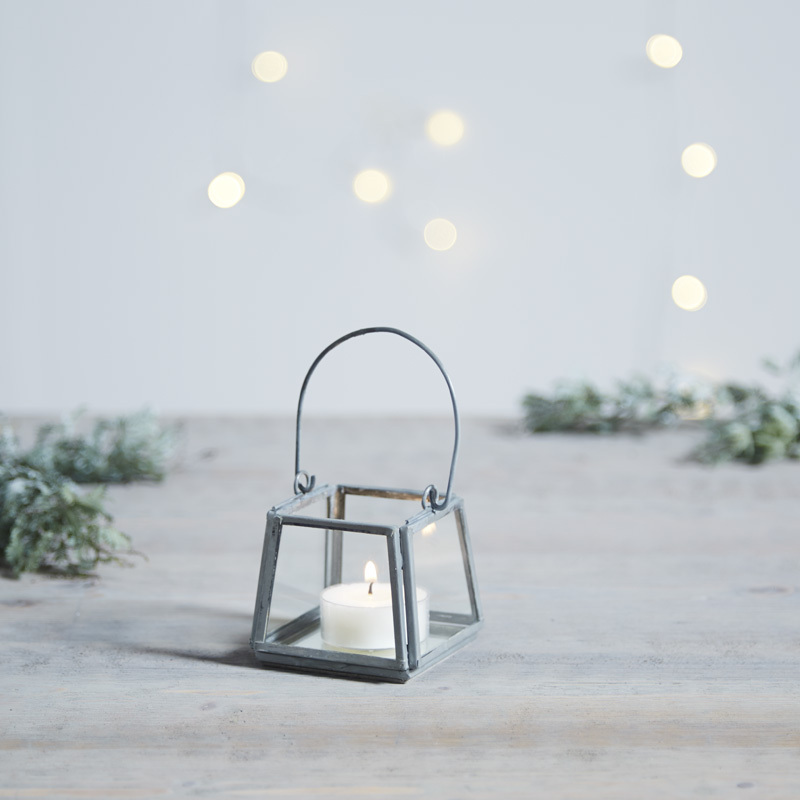 The White Company has brought its trademark paired-back elegance to Christmas decorations. This Nordic mini lantern has larger siblings that look great in a set but its the diminutive appearance of this one that is most endearing. Perfect for tealights at Christmas and beyond. It may not snow this year but with the mini lantern, your days will be merry and bright. Jo Malone’s perfume emporium is a place of wonder. This year it has done Christmas perfectly with a tree decoration that opens to reveal body creame and cologne gifts. Heavenly scents of pear, freesia, nectarine blossom and honey whisper the joy of summer ahead. This traditional-looking candy cane decoration would make a fine addition to any Christmas tree or festive table but there’s a surprise. 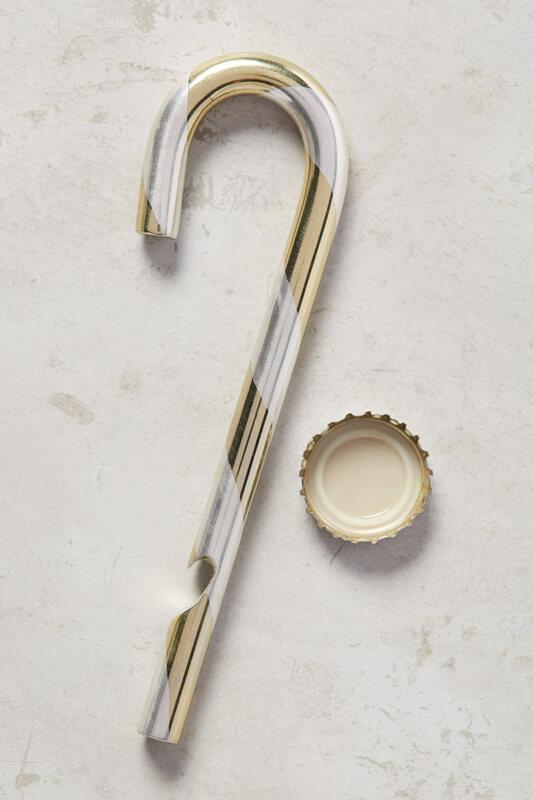 This stainless steel stocking filler from Anthropologie is also a bottle opener. What fun! Champagne is a special drink and deserves to be drunk in style. 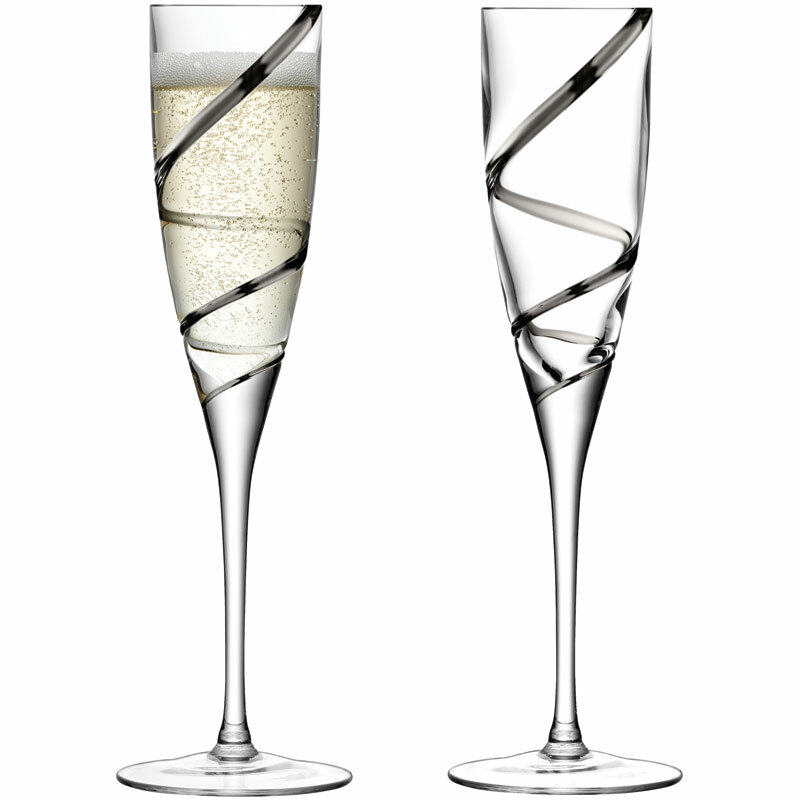 These tall-stemmed flutes from LSA International are mouthblown and have a platinum helix design that looks like a flash of lightening running through your glass. While they make a great gift, they will also add a bit of sparkle when serving champagne to your guests. For many, working life rarely means leaving work without taking projects and paperwork home. While most of us have an office at home, this practical space needn’t be utilitarian and dull. 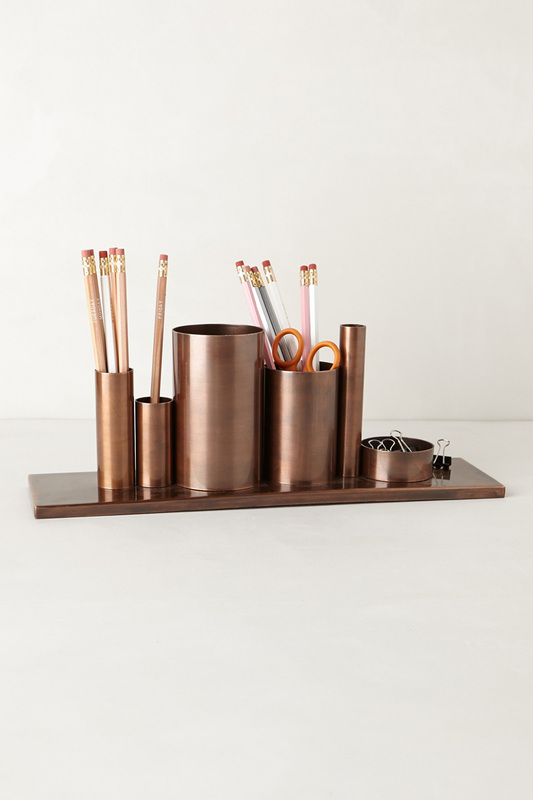 Anthropologie has greated this brushed bronze desk tidy that might just manage to raise a smile while you are finishing off that pesky paperwork. This beautiful and unusual selection of gifts should surprise and delight your friends and family this Christmas and keep the shopping panic at bay, giving you time to enjoy the holiday time with those you love. If you would like expert help to source beautiful pieces for your home throughout Christmas and beyond, contact the ani M INTERIORS team today.